Don goats are predominantly black, but they are sometimes white. Don goats have the highest wool production among all goat breeds. The average wool yield from females is 500 g from bucks it is 1015g. As is known, in all other cashmere breeds and related varieties the guard hairs are much longer than the wool fibers. 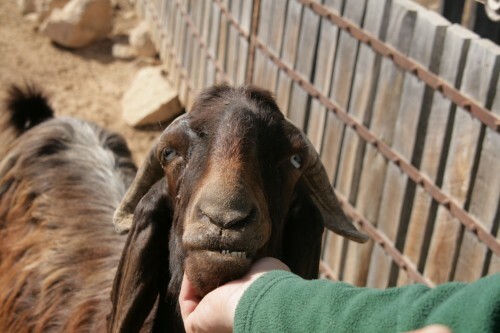 Don goats are also good milkers. The average yield in a 5-month lactation period is 130-140 liters. The milk is noted for high fat content - an average of 4.6% (range 3.3-8.2%). Don goats are very prolific. An average kidding rate is 145-150 kids per 100 females. Their goatskin is mainly used for low-grade footwear. The pelt of Don goats slaughtered in autumn has good fur quality determined by the structure of the fleece (its density and wool fibers longer than guard hairs). They can be used as a basic material in the fur industry. The major enterprise for Don goat breeding is the collective farm Svetly Put situated in Oktyabr district of Volgograd region. On 1st January 1984, this farm had 6500 goats which were characterized by a high classification, uniformity of production type and wool quality. Wool yield from males is 1160 g, maximum 1600 g; from females 560-630 g, maximum 1500 g. In 1982 the average yield per head was 639 g. The bulk of the herd are goats with dark grey wool. Fertility is high: up to 140-150 kids per 100 females. In 1982, the average was 114 kids born for each 100 females; 103 of them survived weaning. In the same year the farm produced 5,000 kg of high quality cashmere.